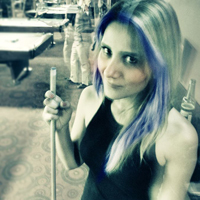 Finding pool cues for women in mind is rare in this industry. Women's pool cues tend to be shorter and are designed with a finesse game in mind rather than a power game. Some women's cues such as the Athena line include cue extensions to provide extra reach without table leaning or bridges. PoolDawg carries over 40 different models of women's cues from Scorpion, Athena, Stealth, Lucasi, Cuetec and even purple pool cues!